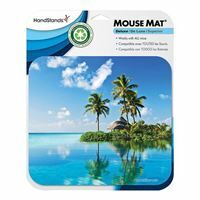 Each mouse pad has a natural rubber backing and soft fabric top. All deluxe series mouse pads have Antimicrobial properties built-in to protect the product from odors & stains. 7.88" x 8.75" x 0.1"